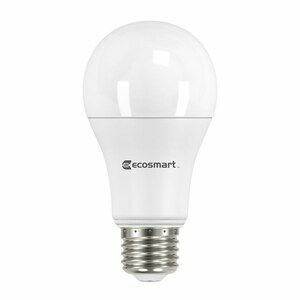 The Ecosmart A19 13W(100W) LED Light Bulb can be used to replace an A19 100W bulb. The daylight LED light has an 13-Watt of power and puts out 1600 Lumens for up to 11,000h life hours. The energy-efficient LED bulbs offer you an estimated energy savings of $105 per bulb over the course of the bulb's life. This light can be for convenient light customization and helps conserve energy over the life of the bulb. Minimum starting temperature -4°F (-20°C). 1,CL35 ANTIQUE GLASS FILAMENT, 2,This 4.5 watt LED bulb provides amber light similar to a 40 watt B11 Incandescent bulb while generating less heat, 3,120 volt 4.5 watt 2200 K(AMBER),E26, 4,Use Only on 120 Volt, 60Hz Circuits. 5,Light appearance: Brightness 320 lumens, Efficiency 71.11 Lumens/Watts, Energy used 4.5 Watts, Life 15,000 Hours, Colour rendering index (CRI) 80 CRI. 100W Equivalent Daylight A19 Dimmable LED Light Bulb (3-Pack) The Ecosmart A19 13W(100W) LED Light Bulb can be used to replace an A19 100W bulb. The daylight LED light has an 13-Watt of power and puts out 1600 Lumens for up to 11,000h life hours. The energy-efficient LED bulbs offer you an estimated energy savings of $105 per bulb over the course of the bulb's life. This light can be for convenient light customization and helps conserve energy over the life of the bulb. 100W Equivalent Daylight A19 Dimmable LED Light Bulb (3-Pack) is rated 4.2 out of 5 by 33. Rated 5 out of 5 by Snipe from Like the ease of reading under these lights even inout... Like the ease of reading under these lights even inout buildings and garage. No noises or flickering . Prefer them over the dimmable type. Just my preference. Rated 1 out of 5 by nokidding from Not Dimmable The bulbs are packaged under this sku: 1001049130 and on this page come in a box marked "non-dimmable". On the bulbs, it says "do not use with a dimmer". I tried them in a fixture (HD support told me to do so) with a dimmer switch and they go from low to full with no in-between. HD's on-line support told me that non-dimmable means that they can dim. It appears it's not the bulbs who are dim. Returned. Rated 5 out of 5 by Silent1 from Love the "daylight" brightness of the bulbs. Way better than previous eco-friendly bulbs. But..... Love the "daylight" brightness of the bulbs. Way better than previous eco-friendly bulbs. But...after about eight months, one of the six bulbs has become a strobe light. I should have kept the receipt so that I could return it under warranty to be replaced. Rated 1 out of 5 by 36 from I was very disappointed when these bulbs, which are supposed to last 11,000 hours, burnt out afte... I was very disappointed when these bulbs, which are supposed to last 11,000 hours, burnt out after just five months of use. They are guaranteed to last for 10 years and save a lot of money. Instead I have to replace them, and Home Depot won't accept their return, since more than 3 months have transpired. The manufacturer also refused to give me a refund. Rated 5 out of 5 by Tiff from Bulbs are working great. Good light. Will have to see as far as how long they last. Bulbs are working great. Good light. Will have to see as far as how long they last. Rated 4 out of 5 by Kay from It fits my needs. It fits my needs.